The Grafton and Center [Farmers'] Alliances of Chautauqua County petition Governor Lyman Humphrey to call a special session of the state legislature to provide farmers relief from mortgages. 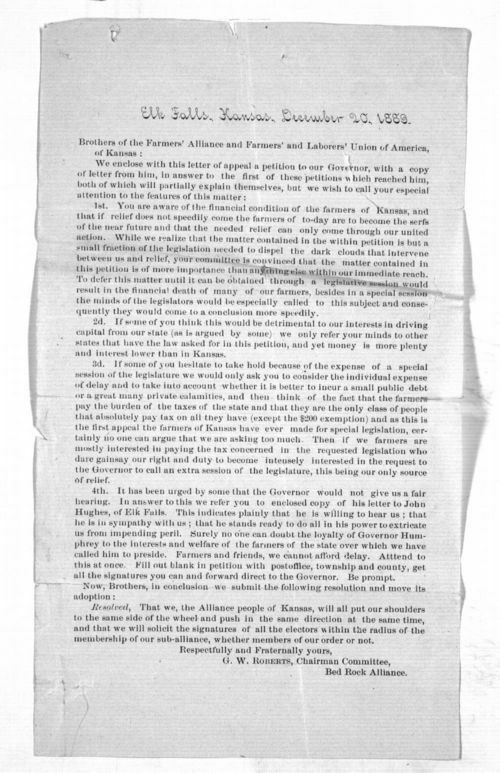 The Farmers' Alliance and Labor's Union of America of Kansas produced the petition form and accompanying resolution circular. The circular claims that legislation is needed immediately since the financial failure of many farmers is imminent. The circular also claims other states have prospered with such legislation and the laws will not discourage financial institutions from operating in the state. According to the circular, farmers bear an unfair tax burden and their requests for financial relief are reasonable. G. W. Roberts, Chairman Committee, Bed Rock Alliance, Elk Falls, Kansas, produced the circular. See Governor Lyman Humphrey to John Hughes, December 11, 1889. People - Notable Kansans - Roberts, G. W.